Jace Wilson is an ordinary kid. When he is dared to jump from the top of a rock quarry, he foolishly agrees. But, he is not at all sure that he is capable of it. In order to test his mettle, Jace goes to the spot alone and jumps off. His descent is not the most terrifying part of his experience, however. The dead body he finds is. In this opening chapter of Those Who Wish Me Dead, Michael Koryta, sets the pace for a thrilling ride through Jace’s fight for his life. As if the dead body was not enough, Jace hears the Blackwell brothers, the murderers, trying to find him. He is fortunate to escape with his life. The Blackwell brothers know who Jace is, however, and are ready to kill him. Jace needs protection, so he goes “off the grid” at a wilderness camp for troubled young men. Jace, who has always been well behaved, has to find a way to fit in with the other campers. He also builds a relationship with Ethan, the man in charge of the camp who will teach Jace survival skills. The Blackwell brothers are not giving up on finding Jace. They trace him to the wilderness program and in order to get Ethan to bring the boy back, they burn down Ethan’s house and attack his wife. From there, it is a race to see if the Blackwell brothers can succeed in their mission to kill Jace or whether Jace can manage to survive. Fast paced and thrilling, Those Who Wish Me Dead was a great read. The characters were well drawn and the little survival lessons in the book were great. Ethan was a strong character and he was well matched to the task of fighting the Blackwells. My only criticism is that the bad guys seem just a little too evil and omnipresent. In some ways, they were not just thugs, but rather like preternatural assassins coming to get this young witness. 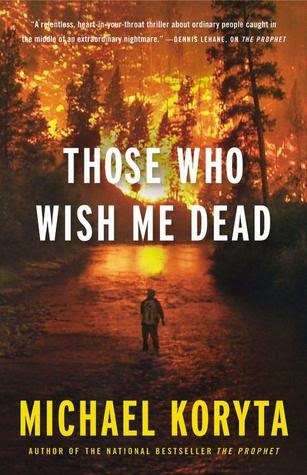 Full of interesting plot twists (including a major one at the end that I did not see coming), Those Who Wish Me Dead, was an action-packed page-turner. I loved it.